Today’s BuzzComix incentive sketch attacks swiftly in the night and leaves no trace! Vote to uncover its identity! I’m not totally sure where I’m manifesting these strips this week. I know today’s is certainly off-beat. All I know is that the thought of some quasi-mystical Adam Sandler worshipers playing guessing games in a soccer mom van made me giggle uncontrollably. Maybe it’s Seasonal Affectional Disorder. I must not be getting enough sunlight. By the way, if you’re wondering why I’m committing a week to spoofing Adam Sandler, it’s because his new movie 50 First Dates comes out on Friday. Cami is making me go, there’s no two ways about it. Not that I’m not looking forward to it. On the contrary, there are great psychological benefits to watching Drew Barrymore smack Rob Schneider over the head with a baseball bat. Get those endorphins pumping! Not much else going on in my life at the moment. I guess one of the houses on my street caught fire tonight. We live in kind of a new area and there a few finished homes without families in them, so I don’t know if anyone was hurt. There was maybe 5 large fire trucks blocking off the street. Their red and blue lights were flashing for hours. It kept freaking out our beagle Truman. He didn’t know what they hell they were. Truman’s birthday is the 22nd. He’ll be two years old. Cami thinks I should do a comic about it. I’d better stop here before this tangent goes flying off into space. It’s late. If you vote for Theater Hopper at BuzzComix, prepare to go to infinity… and beyond! 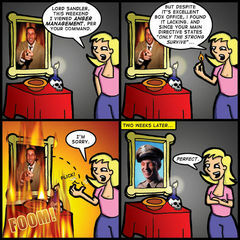 So today is the culmination of The Cult of Sandler storyline. I’ve been getting some really positive feedback on it, so I guess you enjoyed it! 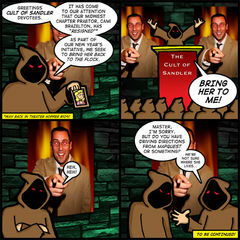 Who knows, maybe our favorite cloaked fanboys will reappear sometime! They seemed to have gone over pretty well. I feel a little guilty that I’m not doing a Valentine’s Day related strip. You might remember this time last year when I wrapped up my Ben Affleck/Daredevil storyline with some loving sentiment. I like doing that kind of stuff, y’know? Proclaiming my love in public. It’s fun! The web comic landscape certainly seems to be shifting recently. First Movie Punks and Movie Comics called it quits. Now Mall Monkeys is closing up shop, too. Damn shame. Those guys really left an impression on the community – good or bad, they left an impression. Of course, I can’t complain too much when co-conspirator Mitch Clem is bringing back Nothing Nice to Say! Start pounding the drums of war now, kiddies. Mitch is coming back to show us how it’s done! Beyond that, I hope everyone has a good Hallmark holiday. It’s funny. In the days leading up to Valentine’s Day, I’m super cynical. I don’t want to give gifts and remind everyone that the holiday was invented by marketing people to help the diamond industry sell more engagement rings. But then I sit down and think about how much I love Cami and everything I want to do for her and things aren’t so curmudgeonly after all. I mean, if you were going to celebrate anything, love is a good place to start!.